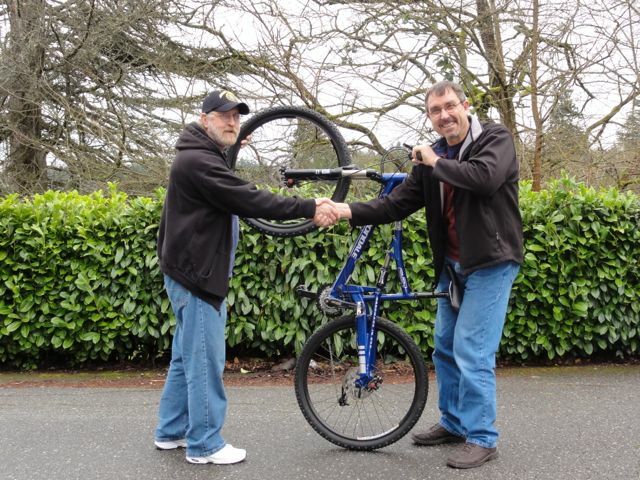 Mike the Mechanic delivers a refurbished mountain bike to a veteran. Andy Newman knows that inside almost every garage in Thurston County there is a decent bike gathering dust. His goal is to give those bikes a new life with a veteran. Newman, a retired Air Force pilot who lives in Olympia, understands that many combat veterans suffer in ways that are invisible to most people, and he wants to do his part to help them recover from both the physical and emotional wounds incurred during service to our country. 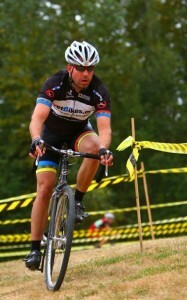 Andy Newman founded VetBikes to help get recovering veterans on quality bikes. He knew then that he wanted to do something to give back to our troops, but the question was how? And the inspiration for VetBikes was born. In 2012, fully retired from the Air Force and working as a pilot for United Airlines, Newman, his brother-in-law Alex Young, and their friend Jeff Aregger landed on the concept for VetBikes. The idea? To collect high quality used parts and build bikes for vets to keep. 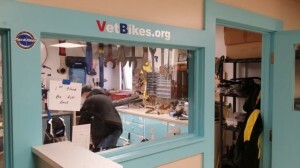 The VetBikes mechanic shop at Building 9 is an important piece of the non-profit organization. Alex Young accepts a donated bike from Jim Brown and the Kona Bikes. Of course, there is the ongoing need for quality bikes and components. Newman emphasizes that they are interested in older, adult-sized, name-brand bikes that were purchased through bike shops rather than cheap department store bikes. They especially need bikes that can be converted into reliable commuters: Old steel mountain bikes, road, cyclocross and hybrid bikes. Newman, Young, and Areggar are all cyclists. Their kids are cyclists, and they know lots of other cyclists. The three men alone had enough spare parts in their garages to build three complete bikes. Newman compares cyclists to golfers and fishermen: “They want the latest gear, the newest and fastest innovation. Therefore, they buy new stuff all the time.” Those leftover parts are how VetBikes works, he says. Instead of selling bikes or parts on Ebay or Craigslist and meeting someone in a parking lot to make a transaction, VetBikes offers cyclists a way to donate their unused bikes, components, and gear to a worthy cause. Due to the generosity of many cyclists, as of last month VetBikes had delivered over 125 bikes to vets living throughout Washington state. Each took an average of six hours to tear down, rehab, polish, and rebuild. Newman wants everyone to know that there are still countless veterans who can benefit from your donations though. If you have unused bikes or components gathering dust in your garage, please consider making a donation to VetBikes. 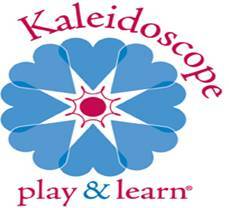 You can learn more about the program by visiting their website at VetBikes.org. 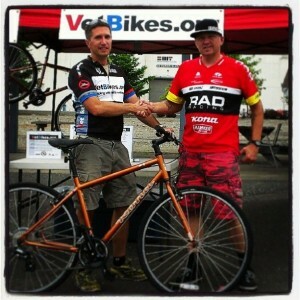 To learn more about the Building 9 program, and to see a King 5 feature about VetBikes, click here. 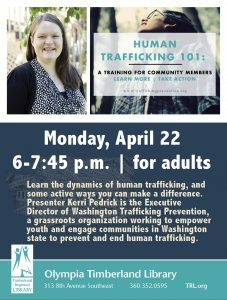 To learn more about the JBLM Warrior Transition Battalion, click here.